Eternal hope and love…. Wreaths and wreath kits available from this weekend… all full of love… for buying now or ordering. Just be in touch if you’d like something. You can use our online form to book a place – or come in and see us, you are always welcome! I have written a load of bits and bobs- always sprawling words, often with some intention of sharing but I don’t for a whole host of reasons- I might blog about those reasons another time, I might not. Pressing ‘publish’ is hard. I don’t even know if it’s necessary but I feel the need to try it so I am. I fear the fear will set in but ‘life is a ride to be enjoyed’- that is what I think most of the time. The ride on one late June evening….Alice Stubbs, Amber Williams, Beks Vera Fallacy, Hollie, Smudge, Missy & Star. Cutting grass, I love to cut grass. I don’t like others cutting my grass. I hate straight line grass cutting. Cutting grass, weeding and watering that’s where we started- at the basics, and the core of it. When doing these tasks you get to see what is new, what is happening and how things have changed. You get to take it all in – enjoy it, and feel like you are achieving things. Achieving things is important to me – it’s so easy to see a day go by and feel like I haven’t achieved anything. Simple things. Cutting back that beautiful mallow. Amber had this role. Mallows are a favourite. Mallows mark a place of ‘home’. The word ‘home’ is a curious word- that sits in me- always wanting to create a little ‘home’ for people. ..’nesting’… trying to create little nests, havens…. like the Mallow. Starting at the core allows time for ‘loving’, and when you get time for ‘loving’ then you feel like letting things go places. Amber got her camera out, Alice made good tea and tried to feed and clean our mini farm and I made a posy all from the garden. We got playing and exploring in all that light and colour. We didn’t want to stop so when we went inside we carried on a little more- putting different bits of home with flowers, letting flowers make different homes. 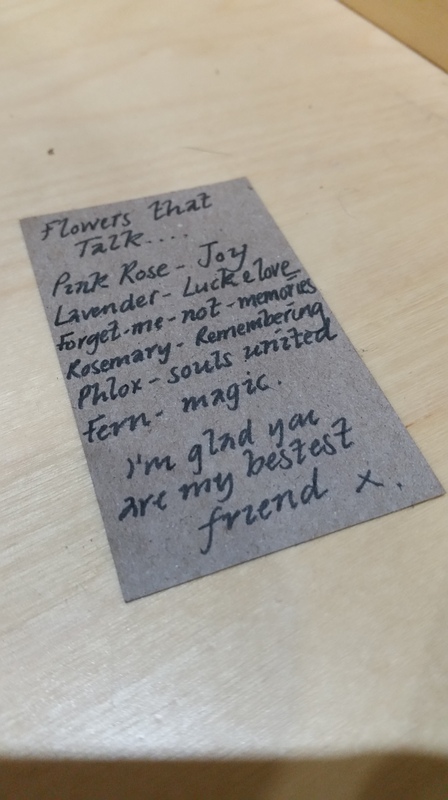 We played with the flowers and they let us- like little fairies they got on board the ride… or did they carry us there. Who knows?! It was fun though. Then we watched Eastenders….. love it! 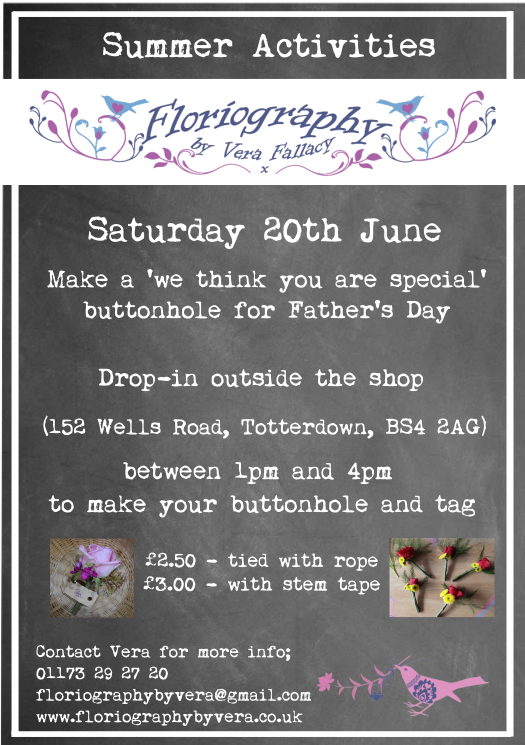 Drop-in outside the shop on Saturday 20th June, between 1pm and 4pm to make a ‘We think you are special ‘ buttonhole and tag for Father’s Day. The Arnos Vale May Fayre is back! Bringing you the best in local craft an produce as well as a host of family activities!! The last fayre was attended by over 1000 visitors and we expect even more for 2015…. • Our new Great War Exhibition. In the Victorian era, “Tussie-Mussies” were floral bouquets used to convey messages with plants, herbs and flowers. Those could be messages of friendship, romance and disdain (hopefully not too much of this). 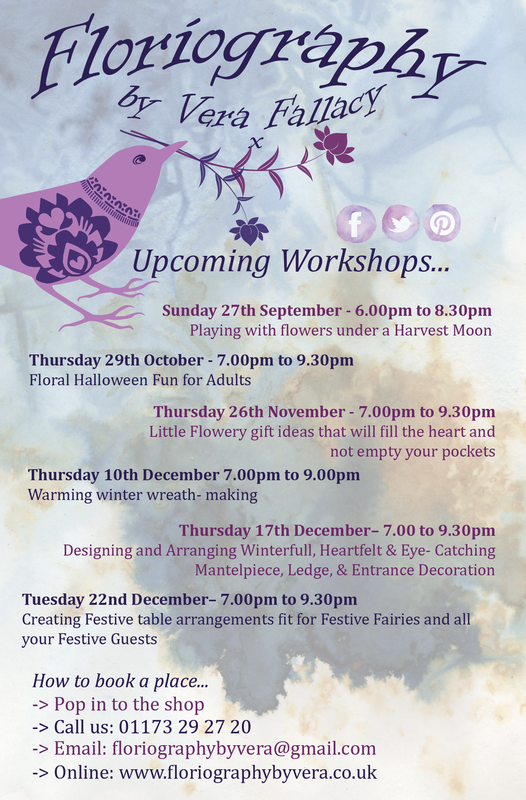 Vera will give you a little history and then work with you to create Tussie-Mussie bouquets using fresh flowers, herbs and foliages that bring together old and new flower languages and get you expressing yourself with flowers. Just trying this out to see if it works. It’ll be here that I update you on all the things I am doing at the shop. Seasonal changes and the like.